Banjo duets alway ends in a duel. See more pigs at the Banjo Pig blog. Marvelous! I love their expressions. This makes me think of banjo jokes. Great characters! ah ah! I love this Illustration! Great picture , this is really fun to look at . Saw the show last night- what a great time. Sorry I missed the opener. Thanks for throwing the show together and count me in if you mount one in Chicago. Awe these lil piggies are great! Fabulous! You've created such a great atmosphere. Love your dueling banjo pigs! Oh how cool is that!!! Love it!! Great illustration for the theme! fantastic, cool, funny. i love them! What can I say? This is totally awesome! These pigs are so darling! Lovely art work! Wow. The view of your book is amazing. Great work! thanks a lo for the psot! i like dit!!!!!!!!!! I'm not sure whether this post is written by him as no one else know such detailed about my difficulty. You're wonderful! Thanks! The pigs was looking so funny while making this rude face, great post. 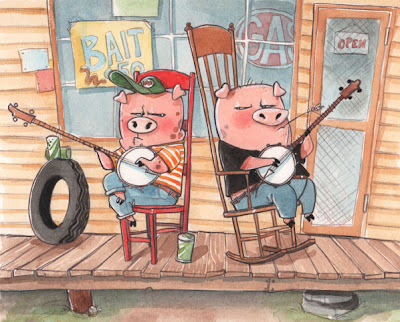 Hey that's new site i found it first time and looking so nice the colors animation, the writing format and all things looking so amazing and these two pigs with name Banjo looks very nice while playing gitaar.Thanks for all this. Homegirl must spend an unhealthy amount of time on those. What is Non-For Profit Corporation? A non-profit organization is an organization that does not distribute its surplus funds to owners or shareholders, but instead uses them to help pursue its goals. Examples of nonprofit organizations include charities (i.e. charitable organizations), trade unions, and public arts organizations. Most governments and government agencies meet this definition, but in most countries they are considered a separate type of organization and not counted as nonprofit organizations.